I greeted my anglers on the docks at Oak Island and my excitement over the superb conditions was written all over my face. On the ride to the flats I had the opportunity to brief Mark and Josh about the fishing, conditions, what to expect and the tactics we'd use to catch them. Mark is an accomplished fly angler and Josh an accomplished spin fisherman. I knew we were going to have a good time. What I didn't know was that the fishing would be exceptional on this day. 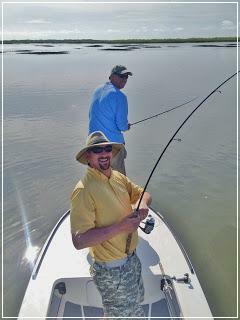 When we arrived at our destination I quickly got Josh on the bow with a topwater plug rigged on a spinning rod and demonstrated how to "walk the dog" and turned him loose on the concept. He had it pegged/perfected in four casts. Next up was Mark. I pulled a Scott 8 wt from the rod chocks and hopped on the bow to go through a few paces on casting angles, strip and strike technique. Mark got warmed up, showed me some nice fly casting and we were on our way. I poled further into the shallows, taking my time, watching some of the birds feeding around us for clues and about fifteen minutes into our search I found the school again. They had moved a great distance into the tide and were feeding again, this time busting the surface and tailing. I estimated the school had over one hundred fish in it. Quietly we readied ourselves; Mark checked and rechecked his fly line, fly and stance and Josh craned his neck around Mark to see the school finning, tailing and feeding. As we advanced to within eighty feet we could clearly see tails pirouetting above the surface eagerly as the fish fed on crabs and shrimp in the soft bottom. At sixty feet I began softly coaching Mark on the target fish tailing on the leading edge of the school. I watched as nerves got the better of Mark on the first attempt and in spite of his excellent casting skills everything his muscles were trained to do with the fly rod fell apart and buck fever took over culminating in a cast that landed short with slack piling up on the final cast leaving his fly motionless as the fish silently tailed past completely unaware of our presence. I quickly gave Josh the go ahead as the school moved out of range and he fired the topwater plug out in front of the school and quickly connected with the first redfish of the morning. Mark kept watch over the school as we landed and ceremoniously took photos of Josh with his catch before releasing the hearty red. Mark's next attempt was perfection. He delivered the shrimp fly literally to the open jaws of a ravenous red as the school approached and instantly was off to the races clearing fly line from the deck. 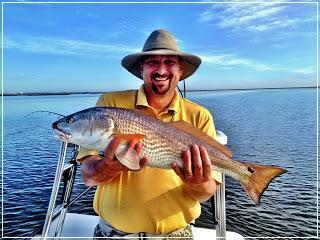 Josh worked the topwater with several blow ups and misses from the fish as we landed Mark's first redfish of the morning. This time we pointed the camera at Mark and his prize. Our next attempt showed me how quick these anglers caught on to the game. We approached the school again, Mark delivered the fly with surgical precision, hooked up on the third strip of the fly, the school parted company with us to the right and Josh fired the topwater with a good lead in the direction they were headed. Josh had no more than a few "walks" of the topwater plug before a big redfish crushed his lure and we had our first double of the morning. I have to admit I thoroughly enjoy the "circus" of watching my anglers swap positions on the bow when they're hooked up on a double. 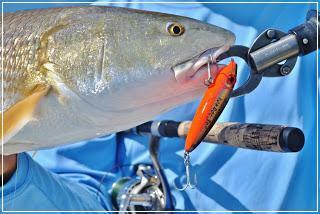 The morning continued this way with innumerable topwater blow ups, some missed and some held fast. Once the tide elevated enough to hinder our ability to throw the fly Mark too picked up a topwater and the guys went toe to toe catching fish together on plugs. We were having a blast. Altogether my anglers were heroes by the end of the day catching numerous double digit fish and Josh landing the biggest fish of the day at thirteen pounds. 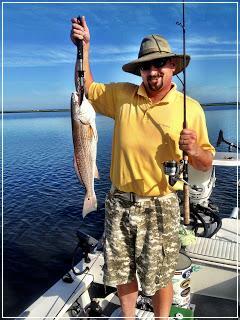 They easily had action on more than a dozen redfish before the day was through. 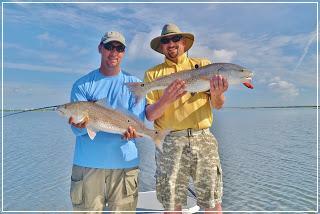 Mark and Josh, I thoroughly enjoyed fishing with you guys and watching you enjoy yourselves on the water. Josh, don't take any crap from Mark I think that hat just might be lucky! I hope to see you again soon for round two. 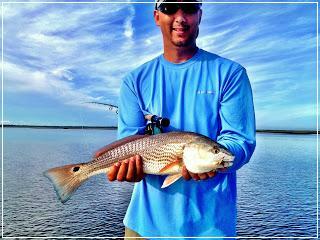 The sight fishing here on the Cape Fear Coast of Wilmington, NC continues to be fantastic and August is a great month to experience epic shallow water fishing for redfish. Don't hesitate to call or book online with our new reservation management system powered by Spotted Tail Outdoors. Part IV: The Finale of the 2007 Beavertail Retrofit! Part 3: Beavertail Restoration Part 3: Sand, Prime, Paint...Repeat. 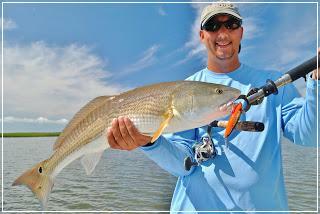 Tailing Reds to Topwater Bites: Wilmington, NC Redfishing Continues to be Excellent!